These prominently located complexes sit at the junction of the busy A352 and East Burton road junction in Wool, Dorset. Adjeacent to the main London-Waterloo rail line and a 3 minute walk from the railway station. The units, offices and storage offer superb access for all types of commuters. The Business centres offer a variety of Offices Workshops, Units, Containers, Storage and Yard Space of various sizes. With flexible lease terms Woolbridge Business Centre or Commercial Yard sites offer the ideal location and agreements for all types of businesses or private individuals seeking working or storage facilities. The site has 24/7 access. Rents are feircely competitive and include business rates and water. Electricity is charged per KWh. Family run business. Run by Mrs Penny Voyce. 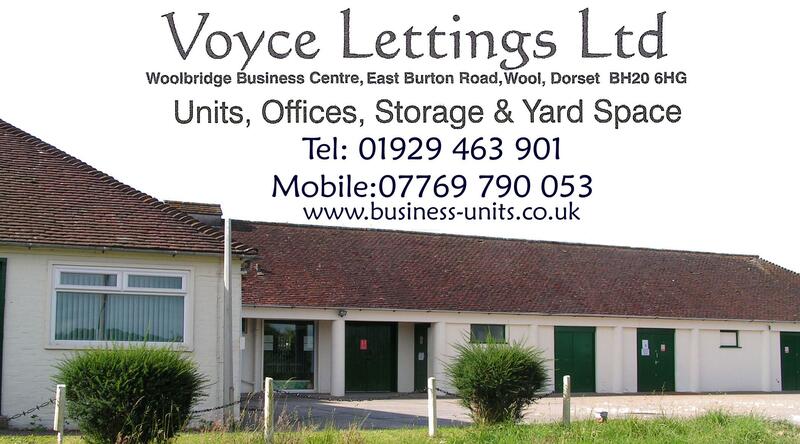 Units, Workshops, Offices, storage, yard space, all located at East Burton Road Wool, Dorset BH20 6HG. Dependent on unit size and position. Rents are all inclusive of Rates and domestic style water usage.